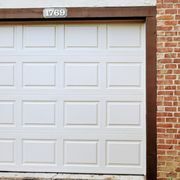 Overhead garage doors weigh hundreds of pounds, and doors that are not properly maintained or which are equipped with older automatic garage door openers can be safety time bombs. All too common are the tragic stories of garage doors injuring or even killing children or pets who found themselves underneath a closing door. Modern automatic door openers with auto-stop and auto-reverse mechanisms have greatly reduced such accidents, but mishaps can still occur if the door and door opener are not properly maintained. "We had an unusual repair requirement. We have horizontal sliding steel doors on our 1950's equipment shed. The upper track was damaged by a roofer's forklift while they were loading supplies onto the roof. The track is made out of very heavy steel, not like the track in today's doors. Toby, responded to my request very quickly and came out of his way to inspect the damage. Although it was not something that he had encountered before, he was able to fix the track and the door is operating better than it has in years. Thank you."